ALT-9008 – The Ruby Air Mattress-Alerta is a replacement alternating pressure relieving mattress system with Triple Cell-On-Cell Air Cells, a static base section and an in-use Height of 8″ for effective prevention and treatment of patients at Very High Risk of developing a pressure ulcer in hospital, nursing and care home environments. With simple to use settings and functionality, this Ruby Air Mattress enables the Carer to quickly set up the mattress system and have it operating at optimal pressure for a specific user with ease. Ruby Air Mattress – Alerta. 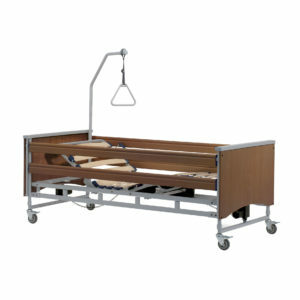 ALT-9008 – The Ruby Air Mattress –Alerta is a replacement alternating pressure relieving mattress system with Triple Cell-On-Cell Air Cells, a static base section and an in-use Height of 8″ for effective prevention and treatment of patients at Very High Risk of developing a pressure ulcer in hospital, nursing and care home environments. With simple to use settings and functionality, this mattress enables the Carer to quickly set up the mattress system and have it operating at optimal pressure for a specific user with ease. The wide range of features make the Ruby Air Mattress – Alerta a highly versatile and Cost Effective Solution which has been manufactured to comply with the most stringent quality and in-use guidelines. The Ruby Air Mattress – Alerta incorporates cutting-edge SensaCare Truflo Technology™ – constant auto pressure sensing through an air sensor and microcomputer regulator to provide ultra-low interface pressure and promote an even ambience for natural sleep patterns and Stable Blood Circulation with Ultra-Silent™ pump operation. Length : 200 cm(6ft.7inches) x Width :90 cm(11.5inches) x Thickness :20cm(8 inches). Pump Dimensions : 29cm(11.40 inches) x 12cm(4.72 inches) x 10cm(3.93 inches). Pump Cycle Time : 6, 9, 12 , 25 minutes. Air Output : 10 litres/minute. Pressure Range : 30-80 mmHg. Care to Comfort also offers : Budget Air Mattress – Alerta, and Bariatric Air Mattress – Alerta.